For other uses of the term beam, see here. "You can totally dig the bug-bots' own blasters out of their guts and use 'em yourself!" The Sentinel beam is a Forerunner directed energy weapon used by Aggressor Sentinels. The weapon is particularly effective against small Flood outbreaks, and is efficient at stripping energy shields. 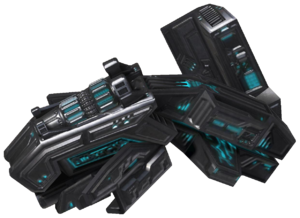 Although typically integrated into the structure of an Aggressor, it can be used as a hand-held weapon if scavenged from a destroyed machine. The Sentinel beam was designed to effectively destroy Flood biomatter, and is intended for use against minor Flood outbreaks. Although the weapon is integrated into an Aggressor's structure, a limited internal power supply allows it to function independently if its wielder is destroyed, though it remains unknown how exactly users trigger the beam. However, when it is not hooked up to an Aggressor, its battery life is very short. The weapon projects a yellow-orange or blue beam of superheated particles, which is capable of effectively cutting through flesh, bone and metal. Two variants of the Sentinel beam are seen: the standard yellow-orange one in the silver housing, and the more powerful blue beam, which is encased in a gold housing. The beams used by the Sentinels at Onyx were a golden color, with temperatures as high as 15,000 Kelvin. Although this variation of the weapon took significantly longer to charge, it is thought to have been capable of depleting a fully shielded MJOLNIR Mark V Armor suit. Furthermore, Onyx Sentinels were capable of cooperating to generate golden beams capable of destroying entire Covenant cruisers. Gold Aggressor Sentinel beam: A Sentinel beam utilized by the gold Sentinels from Installation 05. It fires a stronger blue beam. Safeguard Sentinel beam: The sterilization beams of Safeguard Sentinels are highly efficient at containing and cauterizing intrusions into their assigned protectorate. Beam projectors stolen from these Forerunner constructs are still extremely effective, but do suffer from overheating and a limited internal power supply. Continuous contact from a Sentinel beam can be devastating even for armored opponents, and its ability to rapidly drain energy shields makes it an effective weapon against the Aggressors themselves. The weapon can temporarily overheat if 20% of the battery is used up in one continuous shot; the weapon vents excess heat in an attempt to counter this. It is, obviously enough, extremely effective when used against Flood, and will cut down any form — including the vaunted pure forms — if aimed properly. It possesses a decent damage rate, amazing accuracy and range, and sustained attacks with the weapon will inflict large amounts of damage. The weapon's melee attack is about as strong as that of a Rocket Launcher, and is likewise considerably slow. The melee is also capable of disintegrating a Flood combat form, although this process takes many hits and is impractical in most situations. When compared to the standard silver variant, the golden Sentinel beam is more powerful, however it overheats more quickly and its charge depletes faster. This difference is very similar to the relationship between the Covenant Plasma Rifle and the Brute Plasma Rifle. Like the Energy Sword and the Fuel Rod Gun, the Sentinel beam cannot be used by players in Halo: Combat Evolved. In Halo 2, the Sentinel beam can finally be wielded. A golden Aggressor variant is introduced along with its blue-colored beam. This beam is more powerful, but it overheats and depletes faster. The Sentinel beam has a few visual upgrades and several technical fixes. The weapon now has virtually infinite range and fires a much stronger beam that, if held consistently on an enemy, can destroy them within seconds. The beam fired is now colored purple. The Sentinel beam can no longer be acquired, even after killing an Aggressor Sentinel. In the remastered multiplayer component of Halo 2: Anniversary, the Sentinel beam has been made noticeably more powerful than in the original Halo 2. The lights on the Sentinel beam now change color and build up along the firing channel's shroud to indicate the level of the weapon's heating. Weapon can now be Smart-Scoped. Players killed by the Sentinel beam now disintegrate upon death. The only way to use the Sentinel beam in the Halo: Combat Evolved engine without extensive use of the Developer Mode is to use Halo Custom Edition. Such usage is to acquire the Sentinel beam involves using bump possession to attain an Aggressor Sentinel, then switching back to Master Chief and have him destroy said Aggressor, and exchange a weapon for the Beam. The beam is not visible from the first- or third-person view, and if the player presses the fire button a damaging red beam will appear from the center of the screen. Flood Combat Forms are able to wield Sentinel Beams with one hand. In Halo 2, an Enforcer will fire an invisible Sentinel beam if all of its other weapon system have been destroyed. If the Enforcer is destroyed, there will not be any Sentinel beam left in its wreckage for the player to use. In Halo 2, if the player throws a grenade when his/her Sentinel beam is overheating, sometimes the animation for throwing the explosive will not appear, and a grenade will just "fly" out from the player. In Halo 3, the beam appears to impact with large force, as it is able to flip an airborne Warthog with minimal effort, a feat that not even explosive weapons can achieve. This is easily witnessed during the Warthog run near the end of the game. In Halo 3, the weapon does not spawn on any unaltered multiplayer maps, and gametypes cannot be used to force it to spawn; it is only available in Forged map variants, the Bungie vs World playlist and the Maption Sack playlist. This is likely due to the weapon's increased power and range, which make it devastating in Multiplayer matches. The Forerunner automated turret in Halo 3 fire beams similar to that of the Sentinel beam. The Covenant Focus Rifle is an attempt at reverse-engineering the Sentinel beam, though it has several functional differences. 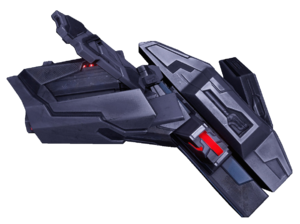 Although the Aggressor Sentinel does make an appearance in Halo 4, when destroyed by Covenant remnant forces, if the wreckage of the sentinels is investigated, the player will find no leftover sentinel beams. This is because sentinels in Halo 4 disappear instead of producing pieces of wreckage. For some reason, in Halo 2: Anniversary, both the basic and gold versions of the Sentinel beam have the same in-game model after they leave the body of its host sentinel. First-person of the Sentinel Beam in Halo 2. First-person of the Sentinel Beam in Halo 2 firing. An in-game side view of a Sentinel Beam in Halo 2. Extracted view of the Sentinel Beam in Halo 2. First-person of the Gold Sentinel Beam in Halo 2. First-person of the Gold Sentinel Beam in Halo 2 firing. An in-game side view of a Gold Sentinel Beam in Halo 2. Both Sentinel Beams designs side by side in Halo 2. First-person view of the Sentinel beam in Halo 2: Anniversary campaign. First-person view of the Sentinel beam in Halo 2: Anniversary campaign firing. An in-game side view of the Sentinel Beam in Halo 2: Anniversary campaign. First-person view of the Gold Sentinel beam in Halo 2: Anniversary campaign. First-person view of the Gold Sentinel beam in Halo 2: Anniversary campaign firing. A Sentinel beam on the Ark. First-person view of the Sentinel Beam in the player's hands in Halo 3. The Sentinel beam's targeting reticule in Halo 3. A player firing the weapon from the passenger seat of a Warthog. Note the single-handed wielding. A Sentinel Aggressor firing its Sentinel beam. Halo 2: Anniversary Sentinel Beam renders. The Sentinel Beam being used on the Halo 2: Anniversary multiplayer map Warlord. A Sangheili firing a Sentinel beam on Skyward. First-person view of the Safeguard Sentinel beam in Halo 5: Guardians. Smart scope with the Safeguard Sentinel beam. The Safeguard Sentinel beam overheating. A Centurion-clad Spartan-IV firing the Safeguard Sentinel beam. A Centurion-clad Spartan-IV with an overheated Safeguard Sentinel beam on Torque. First-person view of the Sentinel beam in Halo Online. ↑ In-game, the calibration dial cannot be adjusted.